© David Eastman, 2013, All rights reserved. This website and its content is the copyright of the author, David Eastman, and is not licenced under Creative Commons licencing. You may download, display, print and reproduce this content for your personal or non-commercial use but only with the copyright and authorship expressly acknowledged. You may not, except with the author's express written permission, distribute or commercially exploit the content. Nor may you transmit it or store it in any other website or other form of electronic retrieval system. This site also contains reproductions of, and links to, a wide range of published resources which do not belong to the author and are not covered by his copyright notice. If you wish to use material that is owned and/or managed by others then you will need to seek their permission to do so. Whilst every effort is made to ensure the accuracy of the information contained in this website, no responsibility is accepted for any errors of fact. However, the author will attempt to correct mistakes and/or provide clarification when required. 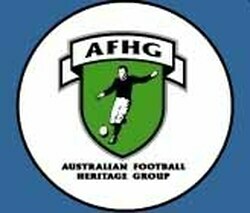 Images of the AFL, VFL, SANFL, WAFL, and other leagues, and their associated football clubs, are used throughout this site to illustrate the history of the game, its teams and its players, and are not being used for commercial purposes. Such logos and images are the registered trademarks of their respective owners and www.hardballget.net makes no claim to ownership of these logos and images. Unless otherwise indicated, all opinions expressed on this website are those of the site author.